A man was exploring caves by the Seashore. In one of the caves he found a canvas bag with a bunch of hardened clay balls. It was like someone had rolled clay balls and left them out in the sun to bake. They didn't look like much, but they intrigued the man, so he took the bag out of the cave with him. 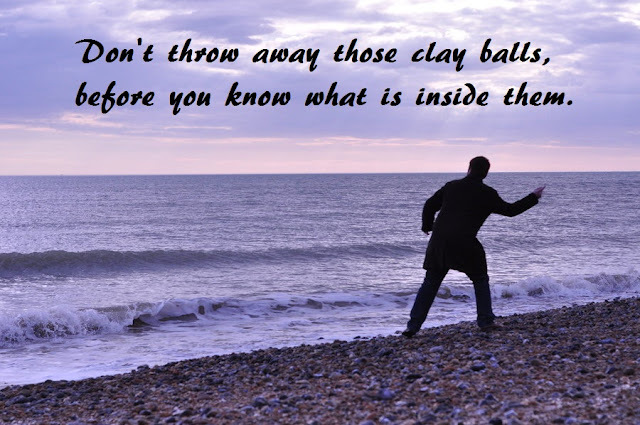 As he strolled along the beach, he would throw the clay balls one at a time out into the ocean as far as he could. He thought little about it, until he dropped one of the clay balls and it cracked open on a rock .. Inside was a BEAUTIFUL PRECIOUS STONE! Excited, the man started breaking open the remaining clay balls. Each contained a similar treasure. He found thousands of dollars worth of jewels in the 20 or so clay balls he had left. What can we learn from this beautiful story? Many times in our lives, God takes us to myterious places where we find many people just like the bunch of hardened clay. The moment we see their outward behaviour and demeanour, instantly we just think that they are of no value except to play with them for some time and then to throw them away. Little do we realise that it is a test that God has given for us to inherit great riches through using them for the Glory of God. Initially we pick them up all with us and them slowly start to throw them out one by one away in to oblivion. Little do we realise the gifts that God has placed within them. If only we can see through those outer shell by spiritually looking deep in to their hearts, we can easily find those costly valuable stones of God's visions, dreams and desires to excel hidden deep within them. But sad to say, after we have thrown out many many people as useless, by the grace of God He makes a few hardened clay balls fall and break before us. Suddenly we see those valuable gifts and graces that are hidden inside those whom we have considered as nobodies until then. Praise the Lord! Suddenly we feel so bad about all the valuables we have thrown in to the sea of humanity without realising that there are treasure hidden inside them all. Think about those times you have thrown people whom God had sent to you as treasures, but that you did not see those valuable stone of hidden treasure buried inside them. Say to the Lord now, "Dear Lord, I am sorry for all the days that I did not see the treasures in people whom you have sent to me. Please open my eyes to see through the clay shell that they reside in. Help me to encourage and build them up to be used for your glory, so that together we might become rich in the kingdom of God eternally. Thank you for finally opening my eyes to this WONDERFUL TRUTH, in Jesus Name I pray, Amen and Amen." "It is the glory of God to conceal a thing: but the honour of kings is to search out a matter." (Prov 25:2, NKJV). Winners see what losers never do, why not try your best with the help of God to see people not for what they have, but for who they are in the inside of them. When God sees us who are imperfect persons perfectly through Jesus Christ, then he is able to show us the real unceasing love of a real Father. Why not see this way a imperfect person whom God sends your way the next time? Best Wishes to be greatly wealthy for eternity, not by seeing things in others as they are, but as they should be!